When diffusive phase transformations occur under applied stresses different modifications appear depending on the nature of the applied stress. The effect of the hydrostatic stresses is essentially to modify the transformation kinetics and the composition of the phases formed. These results are briefly reviewed. 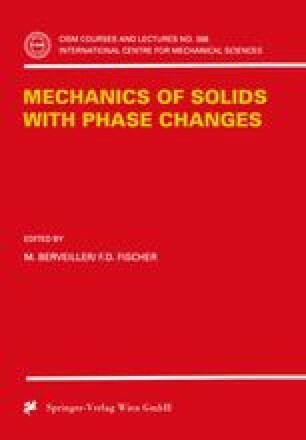 For non hydrostatic stresses, different modifications are observed, changes in the transformations kinetics, in the mechanical behaviour i.e. Transformation Plasticity Deformation, and in some cases in the morphology of the product phases. The effect of monoaxial stresses will be shown considering both kinetics changes and modifications of the mechanical behaviour. The paper is focused on cases were both transformation kinetics modifications and transformation plasticity are observed. Most examples are given for ferrous alloys and namely the pearlitic transformation.